This Mandatory Declassification Review contains material on Principals Committee (PC) and Deputies Committee (DC) meetings on China. Materials include agendas for the November 10, 1993 meeting of the Principals Committee and the February 6, 1995 meeting of the Deputies Committee, as well as a list of bilateral U.S.-China issues. 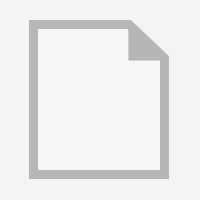 This Mandatory Declassification Review contains material on negotiations concerning China's accession to the World Trade Organization (WTO). 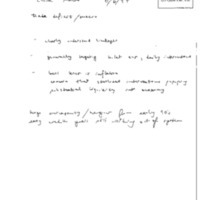 Materials include handwritten notes from two meetings held on August 6, 1997. This Mandatory Declassification Review contains material on Principals Committee (PC) and Deputies Committee (DC) meetings on China. 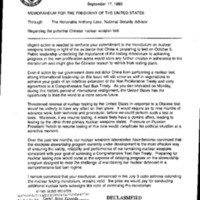 Material includes a memo from the Secretary of Energy regarding an upcoming Chinese nuclear weapon test. 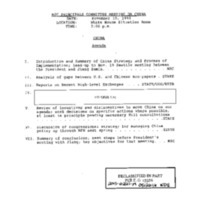 This Mandatory Declassification Review contains material on documents regarding military operations against Afghanistan and Sudan in 1998. 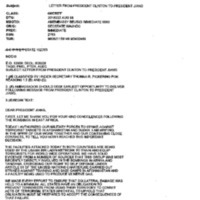 Included is head of state correspondence between President Clinton and various world leaders, including Russian President Boris Yeltsin, Chinese President Jiang Zemin, and French President Jacques Chirac. 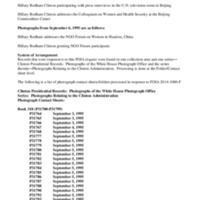 This collection consists of photographs pertaining to Hillary Rodham Clinton's trip to Hickam AFB, Flight to Guam, events in Beijing & Huairou, China in September, 1995. Photographs included in this collection are Hillary Rodham Clinton adressing and attending the Fourth World United Nations Conference on Women at the Beijing International Conference Center, the Colloquium on Women and Health Security at the Beijing Commodities Center and NGO Forum on Women in Huairou, China.